CAn you name five movies that consistently leave you with a great feeling whenever you watch them? Feel good movies that aren’t sugared up snivel fests made for Kleenex but just good, solid movies that are told well, directed with just the right amount of oversight to allow the actors to make you believe and just, well leave you feeling good no matter how many times you watch them, Comfort food movies perhaps? Well I have I have chosen my top five. They are not all critically acclaimed or showered with obsequious flattery from “Critics” who feel the incessant need to leave a movie being “disturbed” or challenged” for it to be worthy of their love. They are, simply, just great movies that tell a great story with great performances. Chef is a 2014 American comedy-drama film written, produced, directed by and starring Jon Favreau, and co-starring Sofía Vergara, John Leguizamo, Scarlett Johansson, Oliver Platt, Bobby Cannavale, Dustin Hoffman, and Robert Downey, Jr. Favreau plays a professional chef who, after a public altercation with a food critic, quits his job at a popular Los Angeles restaurant and returns to his home town of Miami to fix up a food truck. He reconnects with his ex-wife and invites their young son to join him in driving the truck back to L.A. while selling Cubanos in various cities along the way. Favreau wrote the script after directing several big-budget films, wanting to go “back to basics” and to create a film about cooking. ]Food truck owner and chef Roy Choi served as a co-producer and oversaw all of the menus and food prepared for the film.Principal photography took place in July 2013 in Los Angeles, Miami, Austin and New Orleans. 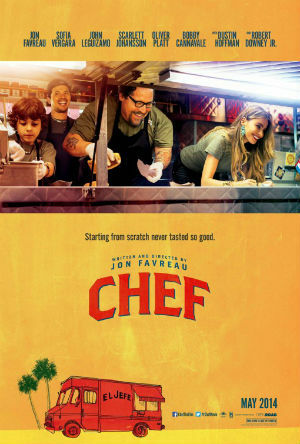 Chef premiered at South by Southwest on March 7, 2014 and was released theatrically on May 9, 2014 by Open Road Films. It grossed over US$45 million at the box office and was well received by critics. Ok so maybe this one WAS a sort of a critically acclaimed movie but that;s because it is just so damn good. Favreau is bordering on comic genius with his natural understated delivery coupled with bombastic outbursts of sardonic banter with the irrepressible John Leguizamo. And the oh so easy on the eyes Sofía Vergara delivers a performance that has just the right amount of latino spice.Okover Oliver Paltt is.. well Oliver Platt and he is hilarious with his deadpan expressions and Millenial 2.0 style outrage at Favreua’s technology fails. Cameo;s by Scarlett Johansson, Bobby Cannavale, Dustin Hoffman, and Robert Downey Jr also propel the story along nicely.. The big name cameo’s don’t detract from the story though. They very much add to it.